St. Jude Memphis Marathon – Registration Now Open! The countdown has already begun! (Check out the new countdown clock on the St. Jude Marathon home page that Bobby personally requested last year! Online registration is now open – The sooner you register the more you save! Yours truly has already been signed up by Mr. Bobby…for the full marathon!!! Eeeek! Will I be able to do it? 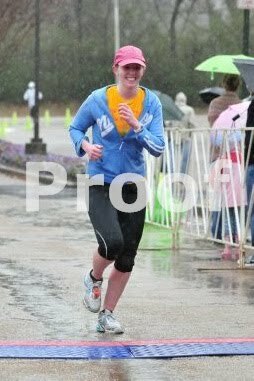 The Germantown Half Marathon – Times & Pics! Here are the official results of the Germantown Half Marathon. I came in at 2:21:40, under my 2:30 limit. (But what really mattered to me was no walking) AND I talked to Keshia and she happened to talk to the fellow who did the timing. Seems a few half-marathoners times were inadvertently increased by 5 minutes because they started with the 5k runners. So my time might have been 5 minutes better! I’m happy either way. Bobby came in at 1:37:45 and 7th in his age group (25-29). Woo-hoo! A couple more photos of Bobby. Looks like there some “Proof” shaped clouds following him around too! Must have been that Thai food. Danny Gallagher came in at 1:55:26 – Third in his age group (15-19) and winner of a sweet crystal trophy. Awesome job for this guy’s first half-marathon! 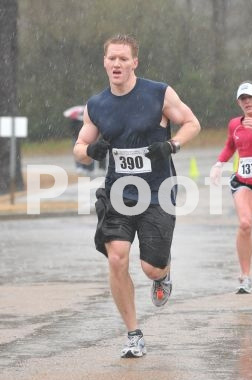 My first half marathon ever was Sunday, March 21 @ 7:30am and what a half marathon it was! Friday the weather forecasts were calling for thunderstorms Sunday – NOoooo! But by Saturday that had changed to just cold rain – Well, that’s better I guess. We ate the traditional pre-run spicy Thai food (HA!) at Bangkok Alley Saturday night to celebrate our friend Morgan’s 25th birthday. We stayed out a little bit later than we wanted, but it was worth seeing everyone. We met Bobby’s brother Danny at 7:00am at the Germantown Municipal Park gazebo (they couldn’t think of the name of it and called it a podium – Whaaaat? Boys…) By that point we could tell it was going to be a cold and rainy day. I decided then that I would run in my cotton hoodie and that I’d just tie around my waist if I got warm. We hung out in the Germantown Great Hall for a bit. We met up with Keshia. Then we all decided to use the restroom one last time. The boys got in and out in 5.2 seconds. Keshia and I were in line for a good 10 minutes (note to the Germantown Great Hall: You need more woman’s bathrooms! ), and I am pretty sure Keshia and I missed the Half Marathon start and started with the 5k folks. But no problems. The first 6 miles went by fast for me. Saw Mike (father-in-law) at around the 5 mile point. Then we headed into the Houston High School and Houston Levee park (where I worked my 2nd summer as a day camp counselor). Saw the folks from Breakaway, Janice (mother-in-law) and Keshia’s husband James. About this time I started to get a little HUNGRY. I’d never gotten hungry at a race before, ever. Mile 8 was when the muscles around my knees started to ache a bit. But at least it wasn’t a sharp joint knee pain, which I’ve had before too – that is worse. And I started to get HUNGRIER. Keshia had some Jelly Belly Energy Beans and I asked for a few. Those suckers are good – I’m definitely going to get some next time. Around this point they offered some Gatorade for the first time, so I snatched that up too. Mile 7-8 was also about when we came out of the park and started coming back down Farmington/Wolf River. So now the chilling wind was coming right at us in our faces. Mile 9 was when we took a turn in to Cameron Brown Park, where Bobby and I worked together my first year as a day camp counselor. Mile 10 I started to get some aches around my hip muscles – Boo! But the knee aches were going away (worked themselves out). Most importantly, I STILL had not gotten a blister, even with sopping wet shoes (see the wonderful Band-Aid Blister Block above). To me, blisters are the worst. So as long as I didn’t get one, I could keep going a long time (even if it is a slow pace). Mile 11 I started to slow down a bit. I was getting hungrier (dreaming about all the food I would eat when I was done) and hips still hurt some. I told Keshia to go on. I was tempted to walk near the end, but it was only 2 miles! That was nothing compared to how far I’d come. Proud to say I kept running (a slow run near the end!) and crossed the finish line at 2 hours, 21 minutes and 40 seconds, quite a bit under my 2 hour & 30 minute goal. As I crossed, I surprised myself by getting a little close to crying – I was SO happy. Not happy it was over, but just proud of myself and caught up in the moment – they were even announcing people’s names as they crossed like the St. Jude Marathon. Bobby, Danny and Janice met me right away. Dan gave me a banana and Bobby gave me some awesome chicken chili. Then we spotted Keshia and James. We all sat down and devoured our food. I looked in my pocket and found the completely soaked band-aids and tissue – glad I didn’t need them (could you imagine me trying to blow my nose in that downpour?). It was a great day and a great race. Just the other day I realized it has been nearly a decade since I started running! When Bobby and I met in the Fall of 2000 at UT Martin, he had been on Houston High School’s track and cross-country team. I was a couch potato who didn’t even own a single item of athletic clothing. So he invited me to run with him around Pacer Pond one night. I though I would die! I’m not sure how far we ran…probably not even a mile? 1/2 mile? 400 yards? It was BAD. But I got better and worked my way up to regularly running a mile several times a week, though almost never outside (just on the treadmill). I stuck with the “Mile Only” rule all throughout college until we moved to Memphis. Then in spring of 2006 I ran my first 5k (3.1 miles) with Bobby and David Spratlin at Shelby Farms on the Chickasaw Trail in preparation for the Youth Villages 5k. Again – thought I would die! Then Bobby and I started doing more 5ks on the weekends. I started running 3.1 miles regularly on the treadmill instead of just a mile. Bobby did the 2009 Memphis Runners Track Club Road Runner Series and the 2009 St. Jude Marathon. Then we both signed up for MRTC’s 2010 Winter Cross Country Series, which would end in a 10k (6.2 miles) – Eeep! So I started joining him on his Monday night Fleet Feet runs, Tuesday night Speed Training and Thursday night Breakaway runs (and those Saturday Hash Runs helped too). So when that 10k rolled around, I had a great time! And now here I am, nearly 10 years later, preparing for my first half marathon (13.2 miles). The Germantown Half Marathon is Sunday, March 21 @ 7:30. My 18 year-old self would have never imagined myself doing this. Excited and nervous? You bet!